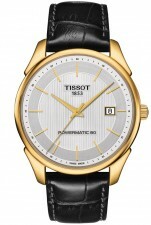 Wonderfully classic, the Tissot Vintage is a tasteful piece with beguiling antique design. The vintages finishes, like Guilloché on the dial, special indices, and the gold case, really give the piece a timeless appearance. The Tissot Vintage Powermatic 80 is the perfect watch to pass down to the next generation, because it will stand the test of time without ever being dated.